The SEA games 2015 Men’s Basketball team roster came and went early February and it saw representatives from the Nakhon Pathom Madgoats, Hi-Tech, Mono Vampires, and Thew Phaingarm. The Madgoats got 8 players on the roster because they damn nearly won every tournament they played in, notably the Thailand Basketball League and the Division 1 tournament. Hi-Tech and Mono had 4 and 2 stars on the roster as well, most of them being regulars on the National Team already. Even Thew Phaingarm was able to send in Up-and-coming Center, Theerawat Chantachon into the mix. If you are counting, that is 4 out of the 5 teams in the BTSL that will be representing Thailand in the SEA Games. The lone team left out? PEA. 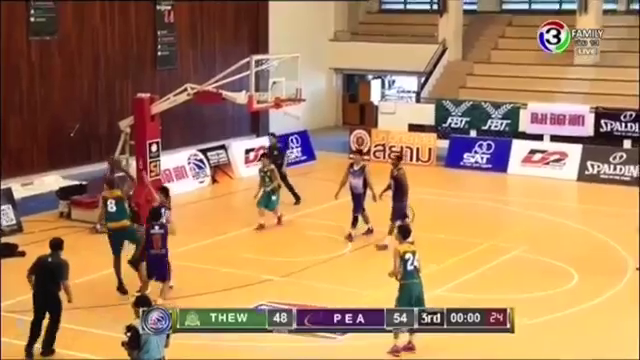 Provincial Electricity Authority (PEA) has been a mainstay in the Thailand Basketball scene being or had been home to many past and present stars. That was until they were gutted of their Stardom when Coach “Seng” Presert Siripojanakul moved to take over newly founded Mono Vampires and took “Bas” Kannut Samerjai and “Van” Pairach Sekteera with him. Yet, they were still a couple of points away from being in the TBL playoffs last year when they finished 5th. Coach “Moo” Krit Pairojpeerapaisarn is the Head Coach of PEA and he got a whole lot of camera time in this game. For a team that is rebuilding like PEA, their team starts and ends with the Coach. They needed to set a system and an identity for their team. It’s been a rough process, with big losses to Mono Vampires and Hi-Tech to start off the BTSL, but this game showed a lot of promise for the “Thundermen”. I spent the last three years of college playing for Coach Moo, so I know a thing or two. One thing is that he knows how to coach a defense. Spend a couple of practice sessions with him and you’ll understand why he was one of the best defenders in Thailand during his prime. He’ll dig into your habits and fix them to be a solid defensive player, if you are willing to listen. I’m not saying everyone will turn into Tony Allen on defense, but you definitely won’t be the weak link in an average pick up game defense. I’m not saying that PEA are playing otherworldly defense right now, because they aren’t. They are averaging 71.33 points allowed per game which is “good” to be tied for 3rd in the BTSL. But they do not have the advantage to put in a true big guy like the Top 3 Big teams. Another thing I know about Coach “Moo” is that he will be noticed. If you had a guy clock in the amount of time that each Coach sits on his chair, I’d be willing to be a fair amount of money that Coach Moo would come in at dead last in average per game. You can always see him stalking the sideline barking orders for the defense or the offense. One thing that the Thundermen and Coach Moo will have to improve is their offense, which they are scoring at only 60.33 points per game which is about 10 points below the league average. Coach Moo has never been an immensely talented offensive coach and the numbers show, which is an area they can, no must, improve on. As mentioned, PEA is the lone team in BTSL that will not have a representative in Thailand’s National Roster in the upcoming SEA Games 2015. Take that information as you want, but with only 5 teams in the BTSL, that tells the tale a bit about the individual talent gap between PEA and the other teams. PEA has been sent to search for talents that have been overlooked by the other teams. Athiwat Hoomart was playing for Hi-Tech in the TBL last year. Thanasit Moolwong was playing for Thew Phaingarm. Now they are both playing for PEA and they will be looking to exploit the opportunity of playing time. One of the most intriguing talents on this squad is Anucha Lungsui. Anucha is a rare case in Thailand basketball. He towers around 1.98 to 2.00 M, but it’s not his height that stands out, it’s how he plays the game. “Tum” can be seen rebounding the ball and bringing it up the court by himself. He tends to start off half court defenses on the perimeter. He will and can slash towards the hoop while also being a threat to hit the three point shot. In this game he really showed a lot of what his capable of and kept the Thew Phaingarm defenders in a bit constant mismatches ending up with 14 points and 14 rebounds. The knee-jerk reaction of seeing a long limbed tall forward that can play both inside and out will immediately draw comparisons to Kevin Durant, which the announcers were quick to do. Personally though, I’d compare Anucha to a player in more of a Lamarcus Aldridge type player. He surely has the talent to play out on the perimeter, but he’s still not completely reliable working out from there. Anucha has shown that with all the potential that he seems to ooze, he’s still only 21 years old and will still make bad decisions when he has the ball. Anucha also struggles to finish. In the TBL, he shot 25.8% in the 2P range which was among the worst of guys who actually took a lot of shots. It is encouraging though that his 3P percentage was at a pretty solid 30.3%, so there seems to be room to improve. A good thing for Anucha is that his older brother is on the team as well (Todsapit Lungsui), who is a star of this team in his own rights, so I’m sure that they can help each other to keep their heads in the game and keep improving. As I said, I played for Coach Moo for the last three years of university and one thing he continuously emphasized was the importance of boxing out. Boxing out is something that Thew Phaingarm should have done more in this game. PEA ended up with more than twice the amount of total rebounds (45-22) and almost four times the amount of offensive rebounds (15-4) than Thew Phaingarm. PEA might not be the best at scoring the basketball, but if you give them that many second (and third, fourth) chances, they will do their damage. 1. Turn Back Time: There was this awkward moment at the end of the third quarter when the ball went loose in Thew Paingarm’s possession ending up in the hands of Bryant Austin and he flung with shot around the same that the buzzer sounded. The shot was good. PEA surely thought it wouldn’t count and Thew Phaingarm was sure that Austin had released the shot in time. The refs walked toward the scorers table and then they talked. Refereeing is an impossible job to do and to please everyone. There’s no way they would come out with a win-win situation here. But keep in mind that this is a game with a live television feed (as I am very much thankful for) and a replay (which I am even more thankful for. How is it that during the whole 3rd quarter break, the scorer’s table couldn’t have just figured that out and went to the TV team that seems to be doing play highlights out of every dead ball? Note: In their defense, the protocol might not have been set to handle situations like this and they did try using a highlight of the Austin shot but the camera angle couldn’t get the clock in the frame. But then again, with the power of replay, I was able to make a justifiable decision and the Austin shot was surely not made in time of the buzzer as seen by the screen capture below. It’s blurry, but the ball is still in Austin’s hands when the clock turned 0. 2. ALL OVER YOUR FACE YA’LL: Austin got the highlight reel for that 3rd quarter buzzer beater, but he might have been pleased without it anyways when he dunked all over out budding star “Tum” Anucha Lungsui all over his face. Austin is known to be a dunker on faces of Thailand Basketball stars when he slams down an alley-oop on Hi-Tech’s “Reuben” Wuttipong Dasom during the Thailand University Games as well. 3. Pick & Roll Terror : Jabril Bailey (or Jabril Taqui, as officially registered) is a versatile forward and the import player for PEA. He has above average ball handling skills and passing skills so he and Anucha Lungsui make a potentially good Pick & Roll combo. Bailey is a good passer off the pick. He can sense when the pick defender is fully committed to the hedge and fires a pass to the roller, in most cases Anucha. Anucha can do a good job of getting to the basket (though a bit lacking in finishing) or he can just pop and fire a mid-range or long-range shot. But apart from the offense, this Duo can be scary on defense as well. Both are versatile to guard up from 2-5. Therefore, if you run a Pick & Roll with these two defending, you won’t get much of a mismatch as they can switch without missing a beat. Please support this league by liking their Facebook page as per the embed picture above. Pictures by Kuk Ornvisa Thewphaingarm and from PEA Basketball Fanclub Facebook Page.